A 23-year-old woman presented with a history of complex congenital heart disease (pulmonary atresia, intact ventricular septum, and hypoplastic right ventricle) and chronic cyanosis. Her history of previous surgical procedures included (1) systemic-to-pulmonary artery shunt by using a 5-mm Gore-Tex conduit (Gore & Associates) (7 days of age); (2) bidirectional Glenn, atrial septal defect (ASD) enlargement, and closure-section of the shunt (1 year of age); and (3) total cavopulmonary anastomosis with a fenestrated 20-mm Gore-Tex conduit. Her postoperative course was characterized by paralysis of the left diaphragm that required surgical plication. During follow-up, she maintained a systemic oxygen saturation of 80% and had multiple events of atrial tachycardia requiring treatment with amiodarone. At 19 years of age, she underwent cardiac catheterization, which showed a mean pressure within the Fontan circuit of 20 mm Hg and a significant shunt across the Fontan fenestration. The results of a balloon occlusion test of the fenestration did not show any change of Fontan pressure; therefore, it was decided to close the fenestration by using a 4-mm Amplatzer ASD occluder (Abbott Vascular). Furthermore, because of the fact that her oxygen saturation values did not significantly change, she underwent embolization of three collaterals between the superior vena cava and the pulmonary veins. Multiple coils and Amplatzer plugs (Abbott Vascular) were used. During an additional 3 years of follow-up, her oxygen saturation levels decreased to 75% and she was in functional New York Heart Association class II. Furthermore, she continued to experience sporadic palpitations and facial flush, as well as events of systemic arterial hypertension. Medical treatments included amiodarone and inhibitors of renineangiotensine. What additional workup would you perform at this point? Dr. Rossi: This woman’s case is not unusual in its late course. She went through many of the postoperation complications of a “successful” Fontan procedure. At this point, I would be mainly concerned with the decrease in arterial saturation levels despite the extensive collateral embolization that was performed. The sporadic palpitations that she experienced may need further assessment. I would also look into the episodes of systemic hypertension. The presence of an associated mild coarctation, which may have progressed with time, must be ruled out. Cardiac imaging. Transthoracic echocardiography and cardiac MRI should be used to confirm intracardiac and anatomy by assessing ventricular function (systolic and diastolic) and chamber volumes, as well as valvular function. Gadolinium can be used for ventricular scarring. If possible, assess myocardial perfusion. Use MRI to identify collateral vessels and their significance. Electrical imaging. Use 12-lead electrocardiography and Holter monitoring to identify brady- or tachyarrhythmia. Hepatic system. Conduct ultrasound (or MRI, if necessary) to assess for impairment, cirrhosis, and malignancy. If necessary, ask for respiratory and hepatic consults to fully frame the importance of abnormalities. Dr. Justino: Patients with Fontan circulation can experience declining arterial saturations for a number of reasons. The most common causes of desaturation in this setting are intracardiac right-to-left shunting or intrapulmonary right-to-left shunting. Intracardiac right-to-left shunt generally implies the development of venous collaterals originating in the systemic veins (which are at high pressure) draining into the pulmonary veins or left atrium (which are at low pressure). In the past, right-to-left shunting through baffle leaks or enlarged Thebesian veins was more common with other forms of Fontan circulation; nowadays, the extracardiac Fontan has rendered these types of right-to-left shunts almost nonexistent. Therefore, in these patients, it is important to look for venous collaterals arising from the innominate veins, inferior vena cava, hepatic veins, phrenic veins, and even renal veins. When these collaterals are found, if they are large in caliber, they should undergo balloon occlusion testing to determine if there is a significant rise in the Fontan pressure before performing permanent device occlusion. Another important cause of desaturation is the development of intrapulmonary shunting, usually related to the development of pulmonary arteriovenous malformations (AVMs). These can be microvascular (microscopic capillary dilation) or macrovascular (large arteriovenous fistulas ranging in size from several millimeters up to several centimeters in diameter). What is/are your recommended procedure(s), and why? Dr. Thomson: This depends on the findings of the previously described investigations, but in general, I would advocate an aggressive approach to treating dysfunctional Fontan circuits. In particular, tackling even mildly obstructive lesions within the Fontan circuit and aortopulmonary collaterals that might be affecting systemic ventricular function. Venovenous collaterals, particularly those decompressing the venous circuit to pulmonary veins, may also be of significance. Overall, I would have a very low threshold for cardiac catheterization, not only to obtain additional diagnostic information (ie, gradients), but also to aggressively tackle problems. Once the circuit has been optimized, I would then carefully look at the medical management and would have a low threshold for the addition of sildenafil in an attempt to minimize resistance in the pulmonary bed. Dr. Justino: I would recommend cardiac catheterization because it can provide all of the necessary physiologic and anatomic information and allow for embolization of collaterals and pulmonary AVMs. Although noninvasive imaging with CT or MRI can find some of these causes of right-to-left shunting, these imaging tests do not allow for immediate intervention. In addition, microvascular pulmonary AVMs are extremely difficult to diagnose by CT or MRI and are best diagnosed in the catheterization laboratory by looking for abnormally rapid transit of contrast through the lungs, as well as performing contrast echocardiography with agitated saline during selective pulmonary artery injections. Dr. Rossi: I would address my three areas of concern with further investigation. First, I would perform a comprehensive cardiac catheterization to rule out any form of obstruction in the Fontan circuit and also carefully search for additional venous collaterals that could cause arterial desaturation. Any obstruction or large collaterals found would be aggressively treated. Second, an aortogram would rule out an occasional coarctation that could be responsible for hypertension peaks. Third, I would order an electrophysiology team assessment to discard intermittent atrial flutter, which is not uncommon in this setting and could be associated with the downhill course that this woman experienced. Figure 1. Angiography in the Fontan circuit in the anteroposterior view. The left pulmonary artery is moderately hypoplastic. We decided to submit the patient to a cardiac catheterization study. We found a telediastolic, single ventricular pressure of 11 mm Hg. The mean pressure within the Fontan circulation was 23 mm Hg and there was a moderate stenosis across the left pulmonary artery with a peak-to-peak systolic pressure gradient of 4 mm Hg (Figure 1). At that stage, a CP covered stent (B. Braun Interventional Systems, Inc.; 45 mm, 8 zig configuration) was implanted over a 12- X 50-mm BIB balloon (B. Braun Interventional Systems, Inc.), which was then implanted across the left pulmonary artery. The pressure gradient was eliminated and the mean pressure in the Fontan circulation was 19 mm Hg. Additionally, we performed multiple saline contrast angiography tests while monitoring with transesophageal echocardiography. We were able to show that there were no signs of right-to-left shunting in the upper part of the body and within the Gore-Tex conduit. However, we did identify significant signs of right-to-left shunting when injecting contrast saline at different levels of the inferior vena cava. Furthermore, no pulmonary arterovenous collaterals were found. Figure 2. 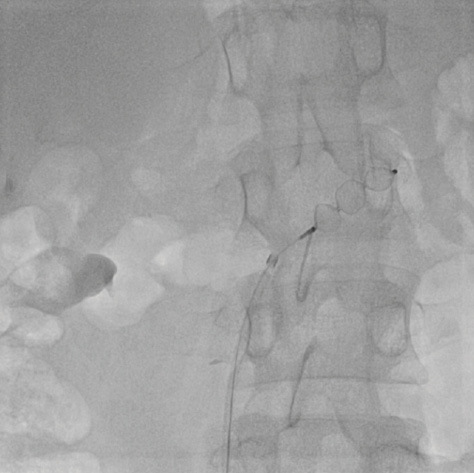 Angiography of the inferior vena cava in the anteroposterior view showing multiple venous/left atrial collaterals. Figure 3. 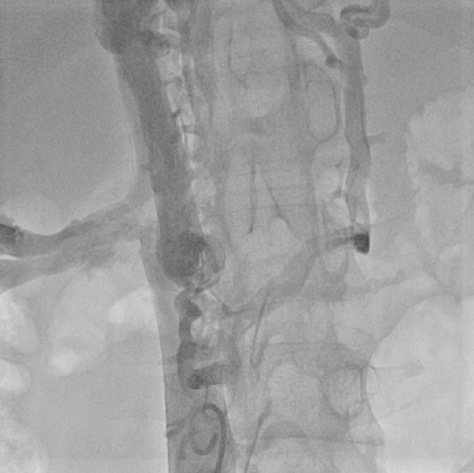 Fluoroscopy in the anteroposterior view showing implantation of a 10-mm Amplatzer vascular plug II. Coronary angiography showed multiple fistulas between the inferior vena cava and the pulmonary veins/left atrium (Figure 2). Three of those veins were embolized by implanting Amplatzer plugs (10-mm Plug II, 12-mm Plug II, 6-mm Plug IV) (Figure 3). After a 3-hour procedure, it was decided to stop and to postpone further treatment of the other fistulas. Her systemic oxygen saturation had increased to 88%. However, the patient still experienced palpitations, facial flush, and sporadic events of systemic arterial hypertension. Furthermore, events of hemoptysis and acute dyspnea occurred. What would you do at this point, and why? Dr. Justino: The patient is presenting with multiple concerns, which may be unrelated to each other. First, the episodes of palpitations may be caused by a primary arrhythmia and should be investigated with a Holter monitor. Although atrial arrhythmias are less common in the modern era of the extracardiac Fontan, these can still occur. Depending on the type of arrhythmia, she could be a candidate for a catheter ablation, which could be performed by transbaffle puncture into the atria. Second, the episodes of hemoptysis and acute dyspnea should be investigated very thoroughly. Hemoptysis can be caused by bleeding from enlarged bronchial arteries (relatively common) or caused by pulmonary vein stenosis (it would be rare for this to present for the first time in adulthood without any surgical or catheter-induced trauma in the pulmonary veins). Flushing and bouts of systemic arterial hypertension are classic findings in endocrine causes of hypertension (as compared with cardiovascular causes, which result in more constant hypertension). Dr. Rossi: All the variables associated with her symptoms and expected bad outcomes were properly addressed. That leaves the intriguing persistent crisis of hypertension. At this stage, it is the time to search for other causes of hypertension, unlikely as they may be. I would start with pheochromocytoma (which fits in the clinical picture with facial flush, palpitations, and crisis of increase in blood pressure) and attempt to exclude secondary hyperaldosteronism, Cushing syndrome, and renovascular and glomerular disease. Sleep apnea and drug-induced hypertension could be easily discarded with careful medical history collection and physical examination. Dr. Thomson: There is no mention of aortopulmonary collaterals (although hemoptysis might suggest these); however, if present, I would embolize these, perhaps over a couple of sessions in the cath lab if numerous. This may improve ventricular performance. Additionally, is the stent in the pulmonary artery adequately dilated? A 12-mm balloon for delivery is small for an adult’s pulmonary artery. Sometimes vessels of this nature within venous circuits can be underfilled. In my experience, it is one of the rare situations in which careful, incremental overdilation of a vessel can be indicated. I would not want to leave any gradient at all. 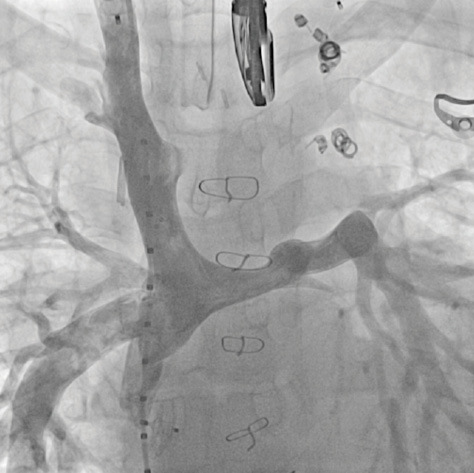 There is reasonable evidence to suggest that systemic-to-pulmonary venous collaterals grow in response to an inadequate Fontan circulation—almost a kind of “autofenestration”—so the presence and apparent reoccurrence suggest an on-going problem.1 Occluding these collaterals may provide a short-term increase in saturation but they are likely to reform, so I would attempt to occlude a portion, taking great care with procedural anticoagulation and potential air ingress during the catheter procedure. I cannot honestly say that the symptoms of flushing would have led me to look for an unusual cause, but a comprehensive set of tests may have revealed a consistent abnormality (eg, raised 24-hour blood pressure) that could not be ignored and would have led to further detailed investigations. What is/are your recommended treatment/procedure(s) and why? Dr. Rossi: In order to exclude renovascular hypertension, which is usually associated with severe hypertension and may be resistant to clinical treatment in young people, I would start with a simple abdominal echography that can show asymmetry in kidney size if the disease is unilateral. Angiotomography can also be used but must be used carefully when there is associated renal disease because of additional renal impairment due to contrast. MRA with gadolinium infusion can be associated with nephrogenic systemic fibrosis. However, both imaging modalities can demonstrate the localization and severity of the renal artery stenosis. Unexplained hypokalemia is the most common clue when looking for primary hyperaldosteronism. If the abdominal CT demonstrates an adrenal mass, measurement of the ratio between plasma aldosterone and plasma renin activity (< 1.0 ng/mL/h) can indicate the presence of a primary aldosteronism. Finally, the presence of a pheochromocytoma can be associated with the clinical picture presented by this patient: facial flush, palpitations, and crisis of increase in blood pressure. Although pheochromocytoma is a catecholamine-secreting tumor derived from the chromaffin cells in the adrenal medulla, measurement of fractionated metanephrines can readily confirm the clinical suspicion. Abdominal imaging studies, such as tomography, can identify an adrenal mass, confirming the diagnosis. In rare cases of a dopamine-secreting tumor, plasmatic dopamine and methoxytyramine can help in the differential diagnosis. Iodine-123 metaiodobenzylguanidine scintigraphy is helpful in confirming adrenal capitation of the radioactive tracer. Pheochromocytomas are derived from chromaffin cells that are also present in neural ganglia (known in that setting as paragangliomas); therefore, one must be careful in excluding this condition when abdominal tomography imaging is normal. Paragangliomas can be found along the glossopharyngeal nerve and the carotid body. Positron emission tomography is the method of choice for diagnosing such tumors. Dr. Justino: I would begin with a Holter monitor. If the previous catheterization was solely focused on angiography and embolization of venous collaterals, I would repeat a cardiac catheterization with careful arterial angiography to look for enlarged bronchial arteries. These can directly originate from the aortic arch, proximal descending aorta, subclavian arteries, and thyrocervical trunks, among others. Consideration should be given to performing CT angiography before catheterization to limit radiation exposure and contrast use and to limit the number of selective angiographic studies performed at catheterization when searching for bronchial arteries. The suspicion for an endocrine cause of hypertension also exists, and the most likely endocrine mechanism in this case is intermittent release of adrenergic compounds given the history of intermittent flushing and bouts of hypertension. If urinary or plasma metanephrine levels are elevated, I would proceed next to imaging. Because the patient can benefit from CT angiography of the chest to look for enlarged bronchial arteries as part of the workup for hemoptysis, I would include a search for a paraganglioma or pheochromocytoma in the CT as well. Figure 4. 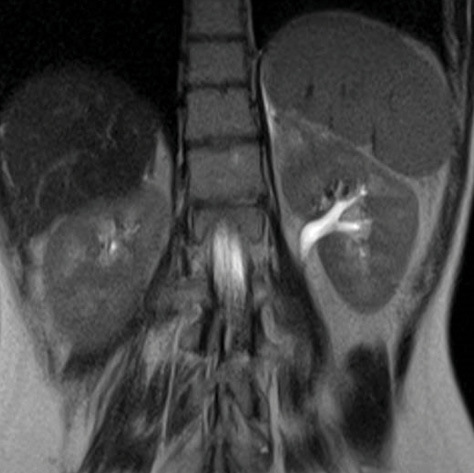 A thoracoabdominal CT scan showing an oval mass of 5 X 6 cm at the level of the left adrenal gland. Because of subtle signs and symptoms of paroxysmal increase of adrenergic status, we decided to further investigate with additional diagnostic tests. Laboratory tests revealed increased levels of noradrenaline and its metabolites (plasma noradrenaline, 5003.7 pg/mL [normal, < 480 pg/mL]; urinary noradrenaline, 1059.5 µg/24 h [normal, < 85.5 µg/24 h]; urinary metanephrine, 489 µg/24 h [normal, < 320 µg/24 h]; plasma adrenaline, 100 pg/mL [normal, 20-190 pg/mL]; and urinary adrenaline, 15 µg/24 h [normal, 1.7-22.4 µg/24 h]). A thoracoabdominal CT scan showed atelectasis of the lower left lung lobe and an oval mass of 5 X 6 cm at the level of the left adrenal gland (Figure 4). Abdominal MRI showed a heterogeneous adrenal lesion, with hyperintense spots due to blood content. The diagnosis of pheochromocytoma was confirmed by I-123 metaiodobenzylguanidine scintigraphy, which showed abnormal accumulation of radioactive tracer in the left adrenal gland. Extrarenal uptake was excluded by F-18 fluorodeoxyglucose positron emission tomography. The patient underwent open left adrenalectomy. Histopathologic examination confirmed the diagnosis of pheochromocytoma. Her postoperative course was complicated by anemia due to hematoma formation in the left hypochondrium. A transcatheter procedure embolized the filling vessel. Twelve months after surgery, the patient’s blood pressure and heart rate were under control and urinary noradrenaline and metanephrine levels were within the normal range. Her systemic oxygen saturation remained around 85% but her clinical status significantly improved. Further procedures will be needed to check her hemodynamic status and possibly embolize the remaining fistulas. The diagnosis of pheochromocytoma may be difficult in this clinical setting. In fact, there may be a significant overlap of signs and symptoms between the two diseases (palpitations, arrhythmias, fatigue, dyspnea, orthostatic hypotension, and events of systemic arterial hypertension). Furthermore, the case showed multiple procedural challenges during the catheterization procedures. The congenital cardiologist should consider P-PGL as a potential cause of clinical deterioration in congenital patients with chronic cyanosis, even in the absence of typical paroxysmal symptoms. 1. Poterucha JT, Johnson JN, Taggart NW, et al. Embolization of veno-venous collaterals after the Fontan operation is associated with decreased survival. Congenit Heart Dis. 2015;10:E230-E236. 2. Rana HQ, Rainville IR, Vaidya A. Genetic testing in the clinical care of patients with pheochromocytoma and paraganglioma. Curr Opin Endocrinol Diabetes Obes. 2014;21:166-176. 3. Kim TH, Yang HK, Jang HJ, et al. Abdominal imaging findings in adult patients with Fontan circulation. Insights Imag. 2018;9:357-367. 4. Bolger AP, Sharma R, Li W, et al. Neurohormonal activation and the chronic heart failure syndrome in adults with congenital heart disease. Circulation. 2002;106:92-99. 5. Favier J, Gimenez-Roqueplo AP. Pheochromocytomas: the (pseudo)-hypoxia hypothesis. Best Pract Res Clin Endocrinol Metab. 2010;24:957-968. Disclosures: Consultant to Medtronic, Abbott Vascular, and Edwards Lifesciences; clinical trial executive committee for Janssen Pharmaceuticals; cofounder of PolyVascular Corp.